Included in the kit is a first aid manual, major wound bandage and instant cold pack in a Unique, stylish, attractive translucent carrying case with dispenser tray that helps keep contents organized. The kit's sliding lock allows it to be hung from hooks. 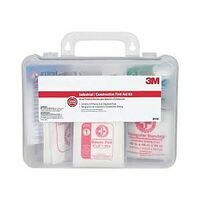 Kit contains: (15) Adhesive Bandages 3/8" x 1-1/2", 30 Adhesive Bandages 1"x 3", (2) Sterile Sponge Dressings, 2" x 2" (2 in one pack), (4) Sterile Sponge Dressings, 4" x 4" (2 in one pack), (1) Sterile Trauma Pad 5"x 9" , (27) Alcohol Prep Pads, (27) Antiseptic Towelettes, (2 ) Providone Iodine Pads, (2) Sting Relief Pads (for insect bites), (1) Adhesive Tape Roll, 1" x 5 yards, (4) Finger Splints, (2) Antibacterial Treatment, (6) Burn Cream .9 grams, (1) Instant Chemical Cold Pack, (4) Protective Natural Barrier Gloves, (1) Tweezers, 4", (10) Cotton Tip Applicators, (1) Scissors,(1) Gauze Roll (3" x 2.5 meters), (1) Eye Pad, (4) Non-Aspirin Tablets, (2) Antacid Tablets, (2) Ibuprofen Tablets, (1) Triangular Bandage, (1) Eye Wash, 1 oz., and (5) Safety Pins. Kit contains: (100) 1" x 3" adhesive plastic bandages, (2) knuckle fabric bandages, (2) large fabric fingertip bandages, (1) 3" conforming gauze roll bandage, (1) 40" triangular sling/bandages with two safety pins, (8) 3" x 3" gauze dressing pads, (1) 5" x 9" trauma pad, (42) antiseptic cleansing wipes, (6) First Aid/burn cream packs (.9gms), (6) antibiotic ointment packs, (1) 4" x 5" instant cold compress, (1) 1/2" x 10 yd. tape roll, (1) pair nickel plated scissors (4"), 4" plastic tweezers (one time use), 2 pair gloves and 1 First Aid Guide. Metal Case with gasket, 10-1/2" x 7" x 2-1/2". Kits have bilingual (English/Spanish) labels. 25 Person Kit - Metal Case.